By now you’ve probably all heard the most recent provocative news story that is causing the latest psychotic episode for the West with respect to Russia. Former Russian spy Sergei Skirpal and his daughter, Yulia, having been seriously poisoned in Salisbury, England earlier this month. Of course, the British government led by PM Theresa May immediately blamed the Russian government before a thorough and independent investigation could have been completed. 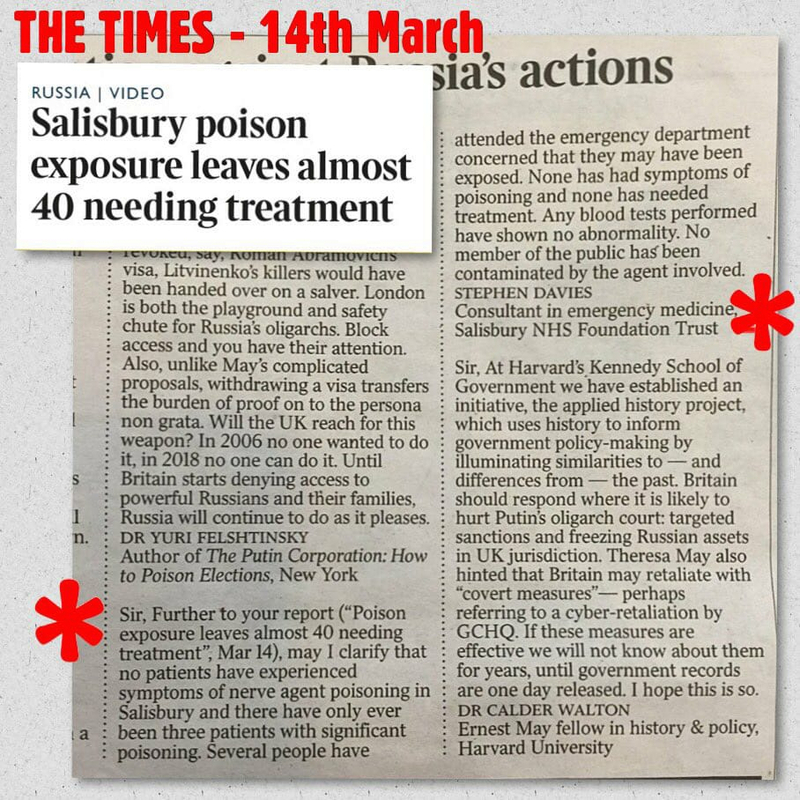 And FM Boris Johnson has been publicly running with the accusations like a bull in a china shop, claiming inside information that the government has solid proof of the poisoning agent and its origins. We’ve all been down this road before – laying the blame for an event at the doorstep of an adversary or the latest country/leader out of favor with the U.S. elite – before anyone could possibly know with certainty who the guilty party is. Pretty convenient, eh? The Russian government has, of course, denied the attack with Putin stating that if the Russian government had pulled off such an assassination attempt with such a deadly type of agent, it would have been successful and the Skirpals would be dead. He also reiterated that Russia’s chemical weapons stockpiles had been destroyed under the oversight of the OPCW. Indeed, readers can go here to see the announcement last October by the OPCW that the destruction process had been completed. In sum, we need to see more actual evidence of such a serious accusation against a foreign government, especially when unsubstantiated claims have already been made, turning said government into a bogeyman (e.g. Russiagate). It’s not like the U.S. and UK governments wouldn’t lie to us about grave matters involving life and death regarding foreign governments. Remember Iraq and Libya. The intellectual stasis displayed by both Mattis and Pompeo is disturbing. These are not so-called “experts” drummed up by the New York Times to further the anti-Putin narrative that has become the centerpiece of the Times’s coverage over the years, but rather serious professionals who hold the security of the United States in their hands. Putin’s pronouncements during his State of the Nation address weren’t a spur-of-the-moment articulation of fantasy, but rather, as he made quite clear, the byproduct of more than a decade of focused intent to counter the threat posed to Russian national security by America’s ballistic missile defense programs. Not only had Russia not masked its intentions in this regard, it had gone out of its way to make sure that the United States was aware of what it was doing and why. In 2007, Russia purposely leaked details about the RS-28 “Sarmat” heavy missile that featured prominently in Putin’s 2018 State of the Nation address to the CIA in a futile effort to get the United States to seriously engage in arms control negotiations. The RS-28 is a direct descendant of the R-36 heavy ballistic missile, better known by its NATO reporting name, the SS-18 “Satan,” which over the course of its nearly 45 years in service has been an acknowledged game changer in terms of American-Russian strategic balance. The R-36’s large throw-weight (almost 20,000 pounds) allowed it to carry either a single extremely large warhead of 20 megatons or 10 independently targetable warheads of 500 to 750 kilotons each (by way of comparison, the American atomic bombs used to destroy the Japanese cities of Nagasaki and Hiroshima at the end of the Second World War possessed yields of 21 and 15 kilotons, respectively). When the R-36 became operational, it gave the Soviets a genuine first-strike capability, able to eliminate over 60 percent of American missile launch control facilities and missile silos while retaining the capability to launch another 1,000 warheads as a second strike, should the United States choose to retaliate. From its inception, the United States considered the R-36 the single most destabilizing strategic weapon in the Soviet arsenal and eliminating and/or limiting it became a focal point of American arms control efforts. The START I Treaty saw the number of R-36 missiles deployed reduced from 308 to 154, and the entire R-36 arsenal was scheduled to be eliminated under the terms of the START II Treaty. The decision by the United States to withdraw from the ABM Treaty in 2002, however, resulted in Russia withdrawing from the START II Treaty in response, and as such maintaining its fleet of R-36 missiles. Russia had planned on allowing the R-36 missile to be retired through obsolescence with no intended replacement; this was the intent behind its START II negotiating position. Conditions in Ukraine generally continue to deteriorate economically and in terms of human rights, but it’s also difficult to keep up with the general crazy twists and turns among the political class. Granted, Ukraine has been a nation with significant divisions ever since its’ independence in the early 1990’s, mostly due to the fact that it’s western areas were historically under the control and influence of either the Poles or the Austro-Hungarian empire and the south eastern parts under the control and influence of the Russian empire. It has not been uncommon to see corruption and fistfights in the Parliament throughout Ukraine’s post-Soviet history. But since the Maidan and its reliance upon muscle from the far-right (e.g. Pravy Sektor, Svboda and later the Azov battalion and the like), things are even more unstable. Less than two years after Nadezhda Savchenko returned from a Russian prison to a hero’s welcome, the ex-military pilot dubbed “Ukraine’s Joan of Arc” is now accused of plotting to blow up Kiev’s parliament and massacre its deputies.The latest extraordinary claims from Ukrainian prosecutor general Yuri Lutsenko – who recently accused former Georgian president Mikheil Saakashvili of planning a coup in Ukraine – are stoking a febrile political atmosphere that bodes ill for Ukraine’s stability ahead of major elections in 2019. ….In her final statement Savchenko said that Ukraine should reform its political system and give voters a chance to revoke legislators and hold referendums. Last month, Ukrainian president Poroshenko said he expected US arms shipments to arrive within weeks. It was also reported by Defense News that DARPA, the Pentagon’s “hi-tech office” has been operating in Ukraine to help Kiev with its “hybrid” warfare against the Donbas. Neither of these actions bodes well for the prospects of peace in Ukraine.